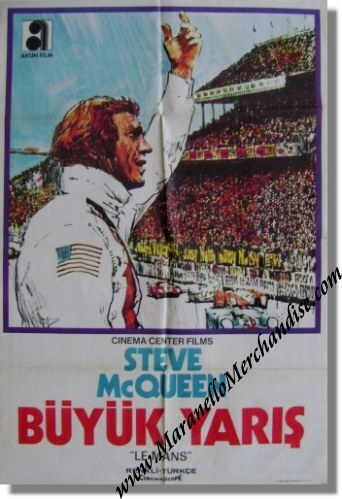 Vintage 1971 Turkish Movie Poster for 'Le Mans' - Buyuk Yaris. Features the "Akun Film" logo and Turkish title "Buyuk Yaris". Le Mans (released in some English speaking countries as both "Le Mans" and as "The 24 Hours of Le Mans"), the 1971 Lee H. Katzin France automobile car racing sports action thriller ("Steve McQueen takes you for a drive in the country. The country is France. The drive is at 200 MPH! "; set in the classic French countryside's historic 24-hour race) starring Steve McQueen, Siegfried Rauch, Elga Andersen, Ronald Leigh-Hunt, and features classic racing legends Derek Bell, Jacky Ickx, and Jo Siffert. The movies is of course famous because of the epic battle between Porsche and Ferrari, Steve McQueen and the music score by Michel Legrand. This Turkish poster measures approximately 27 x 39 inches. Turkish movie culture was significantly different from what we know in the West in the early 1970's and lobby cards (and sometimes posters) circulated amongst movie theaters along with the movies themselves. In the West, theaters could keep the cards, in Turkey they had to go back to the distributor and were sent out again to the next theater. A couple of years ago, we bought the complete stock of "Le Mans" posters from the former Turkish distributor "Akun Film" in Istanbul.